The issue in recently used holders of bevel torches is the occasional inability to return to the correct position after collision and the tedious adjustment procedures for fixing the torch in position after accidental deformation of the rotator. To solve this, MicroStep developed an innovative measurement and calibration system that automatically measures the deviations from the correct torch position and – in spite of mechanically returning the torch to the initial position – adjusts the motion of the machine by software means so that the tip of the torch still moves correctly despite its actual displacement in the holder. The system consists of a ball-shaped torch probe, a calibration station located at the end of machine and the corresponding control software. Furthermore, a brand new construction of the torch holder was designed. The patent pending ITH (Intelligent Torch Holder) is able to detect even small deviations from the correct torch position (e.g. caused by the torch sliding on the material surface in case of big bevel angles) and has an integrated IHS function – initial height sensing with the torch body instead of external probe. *The system was developed within the project “Research of technology nodes on CNC machines for cutting of materials by energy-beam technologies” supported by the Ministry of Education, Science, Research and Sport of the Slovak Republic within incentives for research and development provided from the state budget under the Act no. 185/2009 Coll. on incentives for research and development. Since the introduction of MicroStep’s plasma rotator the company has been making continuous development in the field of bevel cutting technology. The company has now introduced the brand new ABP technology (Additional beveling process) for additional cutting of beveled edges on straight pre-cut parts. 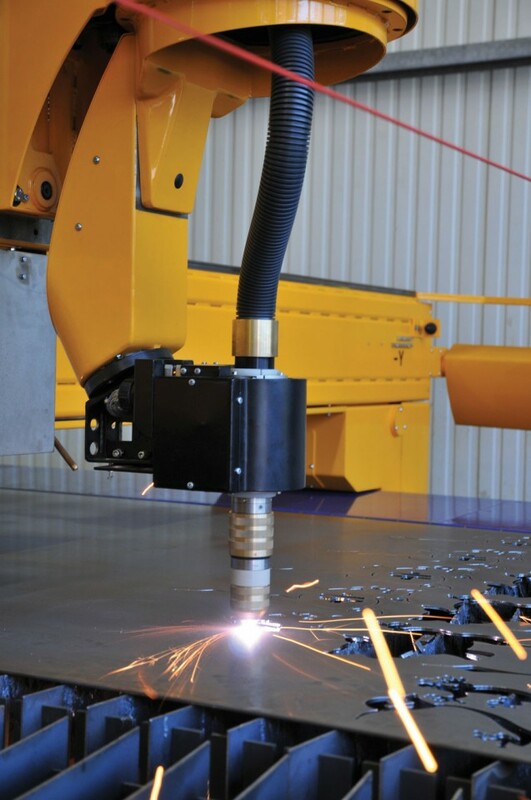 The process enables accurate automated preparation of welding surfaces on parts pre-cut on other machines and/or using other cutting technologies (e.g. oxyfuel) or on parts with thickness beyond the capacity of the particular plasma source for direct beveling (e.g. part thickness of mild steel > 70 mm). The system consists of an additional laser scanner that is mounted on a rotary motion axis attached to the Y, Z support of the plasma rotator, process control hardware and software, and a specialised CAM module for MicroStep’s CAM software AsperWin® that enables creation of cutting plans for additional bevels. The user simply puts a straight-cut part on the table and starts the process – the machine automatically locates the part, compares its shape with the part drawing, accurately scans its contour including the measurement of the inclination of the part’s surface towards the (ideally) horizontal cutting plane (the part may be inclined because e.g. the lamellas of the table are partially worn out from previous cutting and thus do not provide enough support for a smaller part to stay in an exactly horizontal position) and selects the starting point of cutting. 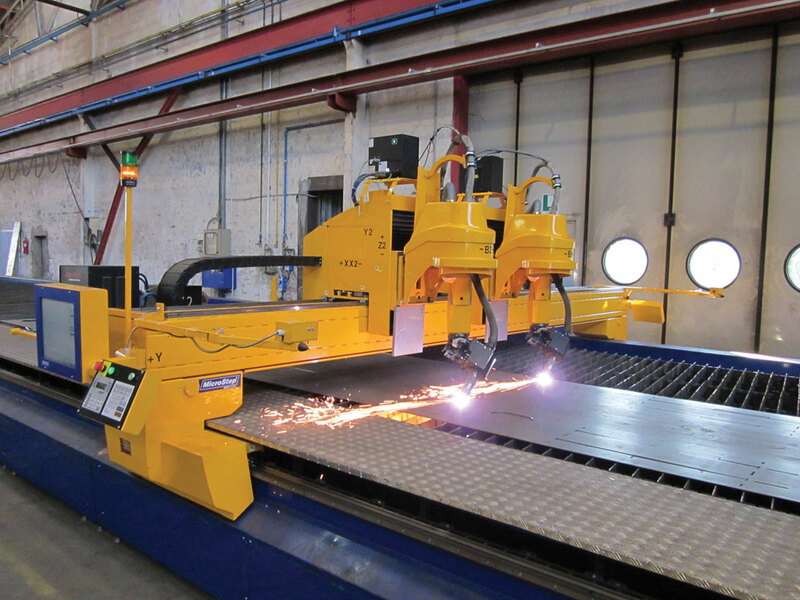 Then the user simply starts the cutting program and after a short while he receives a finished part with accurately prepared welding surfaces, thereby achieving significant time savings in the production process. After cutting the welding edge on the top of the part it is possible to flip the part and repeat the process for making an accurate K-cut. 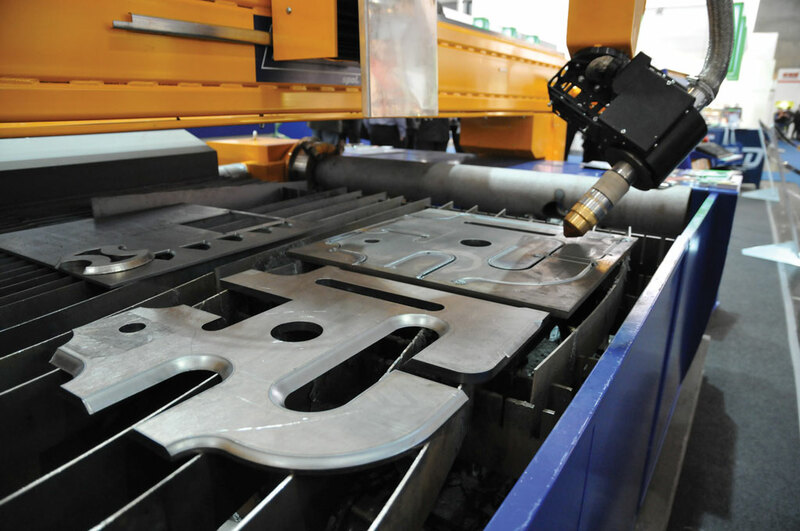 The 5-axis plasma head with infinitive rotation enables bevel cutting of sheets, pipes and profiles with tilting up to 50°. Torch height control for constant angle is provided via plasma arc voltage and for long variable bevels via incremental sensors.